Boat-shaped conference tabletop is part of the HON Preside Laminate Conference Series that is designed to enhance collaboration from private offices to boardrooms. Versatile, person-friendly tabletop offers a modular design that gives you the flexibility to infinitely expand your conference table as your company grows by adding Preside Adder Sections (sold separately). The slab base (sold separately) offers plenty of room for legs and knees. 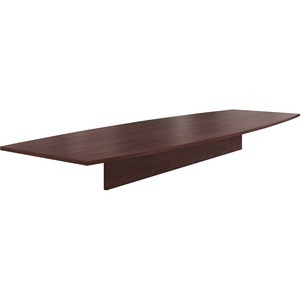 12' tabletop features a traditional edge and durable, Mahogany laminate that is easy to clean and scratch-resistant. The abrasion-resistant, stain-resistant, thermal-fused laminate covers a durable, 1-1/8" thick, solid-core, high-density particleboard that resists warping. Underside of top features an alignment guide for base placement. Support beam and base laminate matches the tabletop laminate.